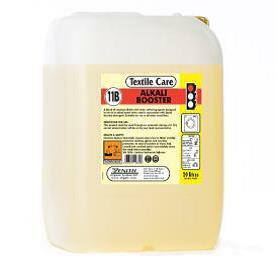 Alkali Booster is a liquid alkali builder/booster, suitable for use in all water conditions. • Sequestrant based building system lowers in use water hardness – increasing the wash performance. • Improves soil removal, especially of food and fat stains. • Increases the pH of the wash solution, allowing Laundry Peroxide Destainer to be used at lower temperatures. • Contains scale controlling agents that prevent scaling in all water conditions, increasing the efficiency of the washing machine. • Prevents the formation and deposition of water hardness salts onto fabric. • Prevents greying of linen.